About one in 12 people have asthma. And those numbers are increasing every year. Although mainstream medicine doesn’t have much of a handle on what causes the condition, they’ll still tell you to avoid common triggers — including exposure to pets. But it turns out — that advice may actually be contributing to the problem. In fact, according to a new study published in JAMA Pediatrics, exposure to pets and even farm animals during early childhood may actually help prevent the development of this common condition. For this new study, researchers looked at data for all the children born in Sweden between January 1, 2001 and December 31, 2010. Overall, the study involved more than 1 million children. It turns out, babies exposed to dogs in the home during their first year of life had a 13 percent lower risk of developing asthma later in life. Plus, babies exposed to farm animals during their first year had a whopping 50 percent lower risk of developing asthma later in life. These results seem to support the “hygiene hypothesis,” which posits that early exposure to a variety of microorganisms may decrease the long-term risks of chronic inflammatory diseases, including asthma. In addition, it probably helps explain why more children today develop asthma during childhood, as far fewer families live on farms. Last Friday, I talked about the importance of children getting regular exposure to the germs, bacteria, and organisms the in soil. Specifically, studies show that spending time in Nature and getting dirty helps the developing immune system in young children. It also plays a part in building the microbiome — which is made up of billions and billions of healthy, probiotic bacteria on the skin and in the GI tract. In fact, studies now suggest that young children who aren’t exposed to natural germs, bacteria, and organisms found in Nature run a greater risk of developing leukemia and other immune-related illnesses. In addition, breastfeeding for the first four to six months of life also strengthens the immune system and helps prevent respiratory infections, which also commonly trigger asthma. As you may recall, I recommended adopting a pet as part of my top 10, sensible health resolutions for 2019. That’s because observational studies show that having a pet is one of the very best things you can do to improve your longevity. Specifically, it helps you stay active and agile as you get older. Plus, pets can boost your mental health. And through their affection and companionship, pets help reduce stress, which improves blood pressure and heart health. Pet therapy can also help people with mental and physical disabilities, including the late President George H.W. Bush (1924-2018), who suffered from Parkinson’s disease later in life. As you may recall, President Bush had a beloved service dog named Sully. Of course, Bush also helped legitimize the role of pet therapy by signing the Americans with Disabilities Act (ADA) into law. Maximus was a Great Dane of the “blue breed,” who my daughter rescued in 2009 from a military couple. The husband was killed in Afghanistan and his pregnant wife couldn’t handle her little Great Dane puppy, so Maximus came to us. 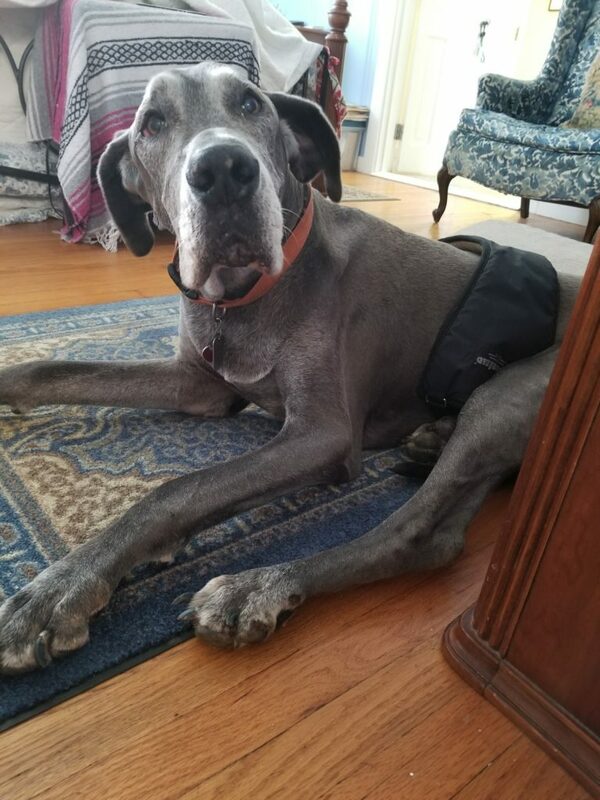 Mr. Maximus remained healthy until November 2017, when he was diagnosed with osteosarcoma (bone cancer) of the upper foreleg. He then started infusions with bisphosphonate drugs, which helped — for a while — to block the osteosarcoma cells from destroying his normal bone. With all due respect to our canine companions, this drug should only be given to dogs, not to people. And with his monthly infusions, Maximus stayed in good shape, until the final few weeks of the summer last year. I highly recommend adding a new four-legged companion to the household for both your health and happiness in 2019 and beyond.